Flat HDMI cable design for easy installation where round cables won't fit. HDMI matrix switch 4 x 2, 4 input x 2 output. A 4 x 2 matrix switch allows any of 4 HDMI input devices to be switched to 2 ouputs independently. Supports deep colour signal 12 bit per channel (36 bit). Supports 480p, 720p, 1080i and 1080p video format. HDCP compliant. Bandwidth: 2.25 Gbps per channel (6.75Gbps total). Supports HDCP. Supports uncompressed audio such as LPCM. Supports compressed audio such as DTS Digital, Dolby Digitalincluding DTS-HD and Dolby True HD. 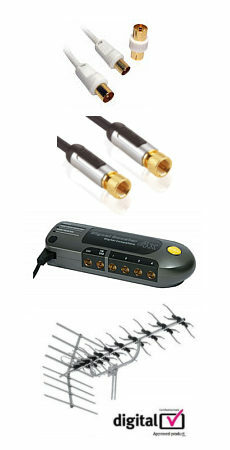 External 5V DC@2A Power Supply included. Konig HDMI Splitter 4 port with 12 Bit Deep Colour Support, 720p, 1080i and 1080p compatible. 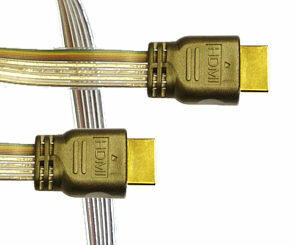 Connection 1x input HDMI female, 4x output HDMI female. Full HD 1080P. Supports 12-Bit deep color. Resolution: 480i, 480p, 576i, 576p, 720p, 1080i and 1080p. High performance up to 2.5 GBps/250 MHz. HDCP support. LED indication: Power, selected channel & port. Built-in equalizer.